Nintendo wasn’t 100% clear on the differences between the two versions of The Legend of Zelda: Breath of the Wild, the next iteration of the world’s most well-known franchise coming to Nintendo Switch and Wii U. We knew the experience would be comparable between the two consoles but, as it turns out, there’s going to be one major change. Well, OK, 180 changes. Nintendo told IGN today that the Wii U version of the game would only be able to run at a 720p resolution while the Switch version, when docked, will be able to do 900p. Obviously 900p isn’t as good as full 1080p but considering that PS4 and Xbox One often suffer from the same problem, there’s no reason to work yourself up too much about it. Both versions of the game will run at 30 frames per second (boo!) but the Switch version will benefit from higher quality environmental sounds – i.e. You might actually be able to hear the aforementioned breath of the wild on the Switch version of the game. In all seriousness, though, the improved ambient sound will improve the overall immersiveness of the game, and is therefore the recommended route to take. 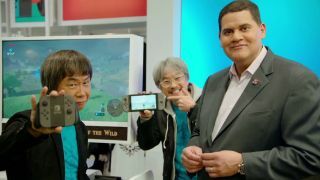 While the resolution and audio details were the two larger discrepancies between the two versions of the game, Nintendo mentioned a few other small differences you’re likely to notice if you play the two side-by-side. That’s kind of disappointing for fans of the series looking to own the collector’s edition, but it’s understandable that Nintendo doesn’t want to overproduce something that may not sell. The Legend of Zelda: Breath of the Wild will launch on both systems March 3, 2017.